Your home town sounds like a welcoming place. I look forward to visiting Winterset the next time we travel through Iowa. Is that Madison County of the book/movie fame? Thank you for your new website – I like it. I do miss you on the show – it’s just not the same. Dear RL Cunningham, thanks for your kind comments. I glad you enjoyed me on TV, but I’m slowing down a bit these days, enjoying projects with fewer deadlines. Lately, whenever I am in “quilty” circles, I hear how much people are enjoying Sara as host of LOQ. I will be her guest on some episodes when taping resumes this fall. Marianne, I have followed your show from the beginning! I stopped and started quilting and sewing as my life changed and now in my 70’s I have made more quilts than ever. So thrilled to be “following” you again. I also read everyone of your daughter Mary’s posts! I have only been to Winterset one time and Liz was in the shop that day! What a thrill it was for me. I hope I can meet you one day. I live in Sioux City. Dianne, you are nice! Thank you for being a first-day commenter on my site! We admire all you have done for your community, Marianne! Winterset is such a wonderful little town because of enthusiastic community members like you! It is a destination location for we quilters, John Wayne fans, and even architect buffs. Congratulations for all your efforts and those of your community leaders. 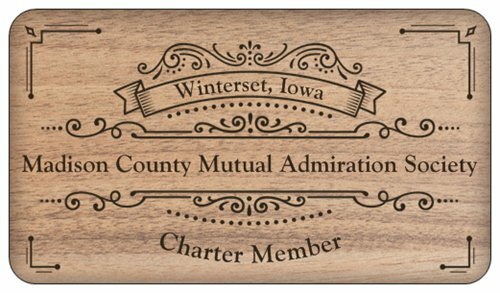 And, although we are not Wintersetians, we love our Madison County Mutual Admiration Society Cards! Hi Marianne! I’ve watched your show forever, and especially enjoy your viewer hints at the end of your program. Lots of good ideas! I, too, started over at 39 and I know the challenges you faced. But life does go on, and it becomes what we make it. I’m so very glad you shared your quilting knowledge with us. My first ever complete quilt was my “I got a divorce” quilt…….my sister felt I needed a new focus..😀 I’ve been quilting ever since. Good luck to you….time for us all to enjoy the life we worked so hard for. Patricia, Thank you for your kind words. Making quilts is something that never lets you down! I am glad to find you still being creative in the quilt world. I have watched you all along, I was sorry when the show began changing and Liz was not there but your daughter was a bright spot. I am now 70, remarried also and for the first time able to slow down. Retirement is not all it is cracked up to be. I enjoy Mary’s postings immensely. Keep up the good work and enjoy. Carrie, I am 70 now, too, or thereabouts. Thank you for you kind words about Mary. I LOVED hosting with her! I’m glad you enjoy PaperGirl. Mary’s a wonderful writer. I hope you will subscribe to my own website and follow my journey as a writer from draft to publication. Mary Shelley’s life is amazing! Our whole country needs this!!!! About those ‘Mutual Admiration’ cards. I just mailed my very last one to an enthusiastic John Wayne Birthplace supporter in Oregon. I’m so sad that I have no more to offer.